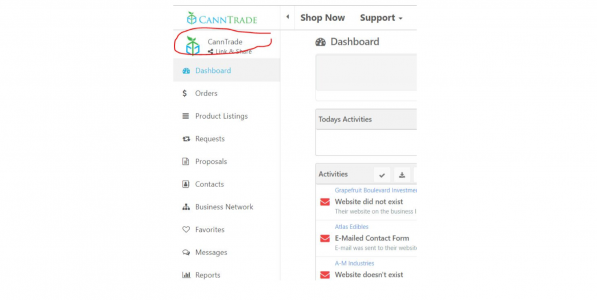 The step-by-step guide to getting your businesses set-up and ready to go on CannTrade. Note: the document below is a generic guide. For a guide specific to your business type, please download the most relevant Quick Start Guide. Find them to the right. Type the name of your business into the Company Name field. You can enter your licensed business name or your DBA. Your business may already be in our database. Once you begin typing, autosuggestions may appear below. 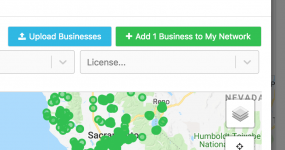 If you see your business pop up, click on your business to claim it. If your business doesn’t pop up, simply enter the entire business name. Click on “Account” on the left vertical menu near the bottom. Then click on the “Profile” tab. Brand Details: Add details about your brand, your brand tagline or motto, and edit (if necessary) your business email and phone number (you may want to use your standard business email and number contact information in this section). Upload your Logo: Repeat the same process above for your brand logo. Click “save” to save it. Website & Social Media: Enter the URL’s for your website and desired social media accounts. Hours of Operation: Set your daily/weekly hours, then click “save” in the hours section. Choose Privacy: Select the privacy option that works best for your business (we recommend “General Public” as it creates the greatest pool of potential traffic for your brand, but still protects you from any non-compliant transactions). This is only for your profile (viewing your brand information and product titles/pictures), and will NOT grant non-verified buyers access to your wholesale pricing or other private business info. Save! : Make sure to click “Save” at the very bottom OR very top of the page. Invite your team members to join your account! Click the green “Invite a New Member” button. Repeat above steps for additional team members. Note: You can always send your spreadsheets and product guides/pricing sheets to success@canntrade.com, and we will upload your products for you. Click on “Product Listings” on the left vertical menu. Click on the Blue “Upload Products” button. Select the “CBD & Hemp Marketplace” spreadsheet to download the spreadsheet. *hint, if you have cannabis products or ancillary products in addition to Hemp/CBD products, you will also want to download the other appropriate spreadsheets. 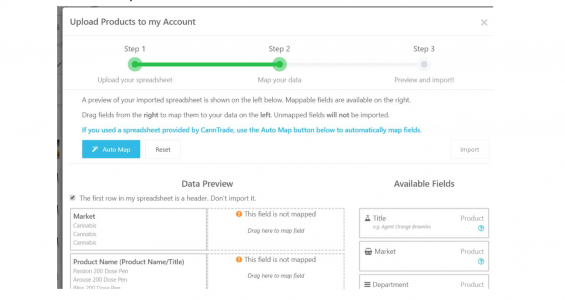 Navigate to your downloaded sheet and open the spreadsheet. Click to “enable editing” on the spreadsheet. Click “Save as” to rename your spreadsheet and save it. 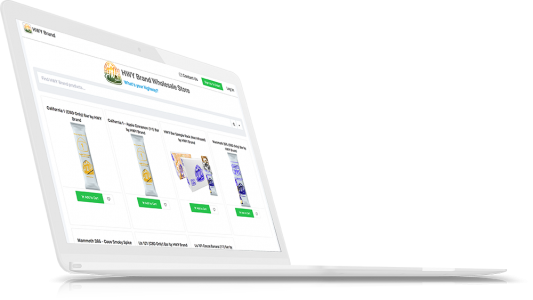 Fill out your spreadsheet with your products, with each product/SKU getting its own row. 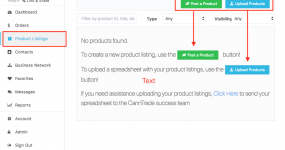 Click here for instructions on how to fill out your product upload spreadsheets. When you have finished entering your product information into the spreadsheet, be sure to “save” your sheet. Click the orange area that says “Upload your product listings here” (to get here, click on “Product Listings” > “Upload Products.”) and choose your saved product upload file. Review the automapped fields to make sure the system matched the right information type (middle column-highlighted in green) to your columns from your spreadsheet. Additional info types may be in the right column (available fields), and those can be dragged to the left. Once you’re satisfied that the right information is mapped to the right fields (not all fields must be used), click the green “Import” button. 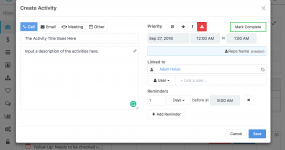 You can edit, duplicate, or add pictures or other information to your products from the grid OR by clicking into the product, making the changes, and clicking “save” at the bottom. Publish your products. Click the green cloud icon to publish your products. 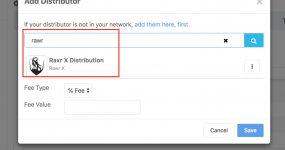 We recommend publishing your products to the open marketplace (so all verified compliant buyers can see them), but you also have the option of limiting visibility to the businesses in your network. 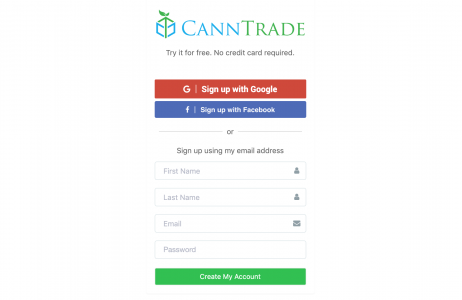 CannTrade gives you the ability to have a verified wholesale cannabis storefront (or just your products & offerings) on your own website. It’s really as simple as grabbing your wholesale storefront link, and then having your website manager connecting the link to a button on your site. (We recommend the button say “Wholesale” or “Buy Wholesale,” or something similar. Here is how to grab your wholesale link. Click on your logo (link & share) on the top left of the vertical menu. Click the “Link” button under the wholesale store, then click the icon to the right of the link to copy it! Once team members have joined the account, you can apply roles to those users so they have the proper permissions. 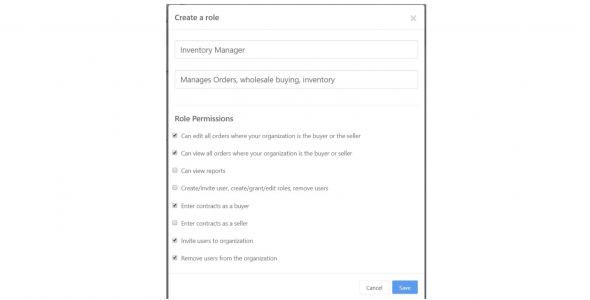 To Create a role, Name the role, enter a description, and select (by checking the checkboxes) the permissions the role should have. Be sure to click “Save” when done. 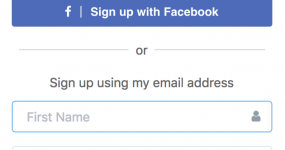 Once you have created the roles you need, you can apply those roles to the user accounts. Next to a user, select the correct role from the dropdown menu. This concludes the Quick Start Guide. You’re now ready to take advantage of the significant business opportunity presented by CannTrade. We’re happy to have you. If you have any questions about the above functions and features, or any other part of the CannTrade platform and markets, please reach out to us using support@canntrade.com. Additionally, if you’d like a demo or training session for yourself, a business partner, or team member(s), please feel free to schedule one at your convenience by going to CannTrade.com and clicking on the “Request Demo” button.